Waterloo, ON – 2014-1-16 – OpenText Corporation (NASDAQ: OTEX) (TSX: OTC), a global leader in Enterprise Information Management (EIM), announced today that it has completed its previously announced acquisition of GXS Group, Inc. (GXS), expanding OpenText's leadership in EIM by combining OpenText's Information Exchange portfolio with GXS's cloud-based business-to-business integration services and managed services. "I am delighted to welcome GXS customers, partners, trading community and employees to OpenText," said OpenText CEO Mark J. Barrenechea. "We are committed to leading Enterprise Information Management with the market's best products and cloud-based services. Our combined cloud will now manage over 16 billion transactions per year, approximately 600,000 trading partners and 40,000 customers." Global HQ in Gaithersburg, MD. EMEA HQ in Sunbury, UK. APAC HQ in Hong Kong, PRC. Latin America HQ in São Paulo, Brazil. Japan HQ in Tokyo. 2,889 employees in 20 countries with 40 locations serving customers in 60 countries. OpenText paid $1.065 billion in cash consideration (of which approximately $887.9 million was used to repay outstanding indebtedness of GXS and approximately $29.3 million to pay certain GXS transaction and other related costs), and approximately $53.7 million for the working capital of the business. $60 million of this cash consideration is subject to customary escrow terms and conditions for a period of time post-closing. Pursuant to the merger agreement, OpenText also agreed to issue to the sellers $100 million worth of OpenText common shares based on an average trading-price for the 10 days ended January 14, 2014, but at a price no lower than $69.73 per share and no higher than $77.07 per share. Given the applicable trading average, the shares were issued based on a deemed price of $77.07 per share, resulting in the issuance of 1,297,521 shares, or approximately 2.2% of OpenText's outstanding shares. The aggregate value of these shares, based on the closing share price as traded on NASDAQ on January 15, 2014, was approximately $117.7 million. 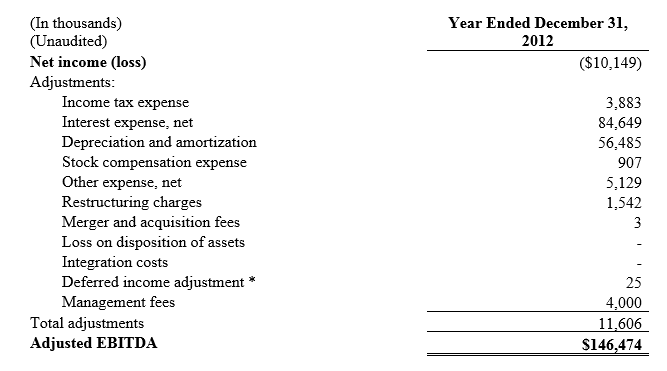 The cash portion of the consideration included $265 million of cash on hand and $800 million borrowed under a new term loan facility entered into among Ocelot Merger Sub, Inc., a wholly-owned subsidiary of OpenText which merged into GXS in connection with the acquisition, as borrower, OpenText, as guarantor, certain of its subsidiaries, as guarantors, the lenders named therein, Barclays Bank PLC (Barclays), as sole administrative agent and collateral agent, and with Barclays and RBC Capital Markets as lead arrangers and joint bookrunners. The term loan has a seven year term and is secured by a first lien on substantially all of the combined company assets on a pari passu basis with OpenText's existing credit facility. A portion of the cash consideration in an aggregate amount of $887.9 million was used to repay or redeem, and thereupon terminate, satisfy and/or discharge, outstanding indebtedness of GXS. The 1,297,521 OpenText common shares were delivered only to GXS preferred stockholders that were verified as accredited investors under the U.S. Securities Act of 1933, as amended, and account for approximately 2.2% of OpenText's outstanding common shares as of January 15, 2014, and, as previously disclosed, the holders of such shares have certain rights under a registration rights agreement with OpenText. Additional information regarding the closing of the acquisition and related financing is available in OpenText's Current Report on Form 8-K filed with the Securities and Exchange Commission (SEC) on January 16, 2014. Further details on the transaction and strategy will be provided on OpenText's FY14-Q2 earnings results conference call taking place Thursday, January 23, 2014 at 5:00 p.m. ET. Investors should dial in approximately 10 minutes before the teleconference is scheduled to begin. A replay of the call will be available beginning January 23, 2014 at 7:00 p.m. ET through 11:59 p.m. on February 6, 2014 and can be accessed by dialing 416-640-1917 (international) or 877-289-8525 (toll-free) and using passcode 4661601 followed by the number sign. For more information or to listen to the call via web cast, please use the following link: http://investors.opentext.com/events.cfm. * Purchase accounting requires that deferred income of an acquired business be written down to fair value of the underlying obligations plus associated margin at the date of acquisition.